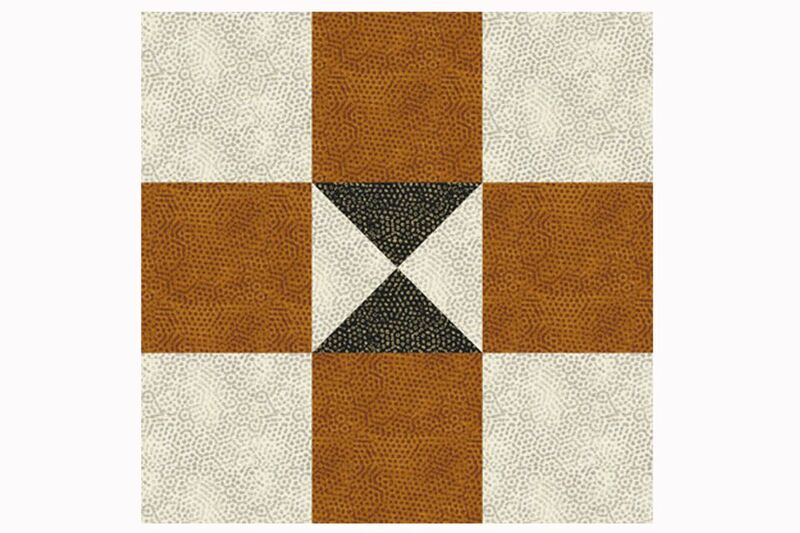 The Practical Orchard quilt block pattern is a perfect project for beginning quilters. Most of the quilt block's patches are squares, but a single quarter square triangle unit at the block's center offers a bit of practice with quick piecing techniques. The pattern explains how to make two quilt blocks. Repeat to make additional Practical Orchard blocks, and change the fabrics each time if you would like to make a scrap quilt. Finished Practical Orchard quilt block: 9" x 9"
Draw a diagonal line from one corner to the opposite corner on the reverse side of the lightest 4-1/4" square. Pair the marked square with the dark square of the same size, right sides together. Use my quick piecing method to create two half-square triangle units from the pair. Each unit should measure 3-7/8" x 3-7/8". Draw a diagonal line on the reverse side of one of the units, from corner to corner and traveling across the first seam. Place the two units right sides together, all edges matched and contrasting colors facing each other. Use straight pins to secure fabrics. Sew the pair together with two seams, each 1/4" from the new line drawn on the diagonal, just as you did in Step 1. Cut apart and press open to create two quarter square triangle units that measure 3-1/2" x 3-1/2" each. See my quick pieced quarter square triangle units for complete instructions if you aren't familiar making this type of assembly. Gather four 3-1/2" x 3-1/2" golden brown and four light squares of the same size. Arrange the squares and one of your quarter square triangle units into three rows as shown. Sew components of each row together with a quarter inch seam allowance. Press seam allowances towards the darker squares. The Practical Orchard quilt block should measure 9-1/2" x 9-1/2". Use remaining patchwork to assemble a second quilt block. This easy baby quilt pattern is made with Practical Orchard quilt blocks that are sewn in two different color configurations. The quilt blocks in the baby quilt finish at 6" square, a bit smaller than the blocks on the previous pages, and the quilt measures about 35" x 47".